↑ "Chess champion Garry Kasparov granted Croatian citizenship". The Guardian. London. 28 February 2014. ↑ "Garry Kasparov | Chess & Games". Encyclopedia Britannica (अंग्रेज़ी में). अभिगमन तिथि 2018-12-26. 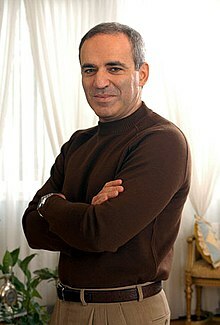 ↑ "Kasparov, Garry FIDE Chess Profile - Players Arbiters Trainers". ratings.fide.com. अभिगमन तिथि 2018-12-28. ↑ "Garry Kasparov | Chess & Games". Encyclopedia Britannica (अंग्रेज़ी में). अभिगमन तिथि 2019-01-20. ↑ "Kasparov - Kramnik Classical World Championship Match (2000)". www.chessgames.com. अभिगमन तिथि 2018-12-27. ↑ "Kasparov vs Deep Blue". www.chessgames.com. अभिगमन तिथि 2019-01-20. ↑ "Kasparov vs Deep Junior ends in 3-3 draw". Chess News (अंग्रेज़ी में). 2003-02-08. अभिगमन तिथि 2019-01-20.